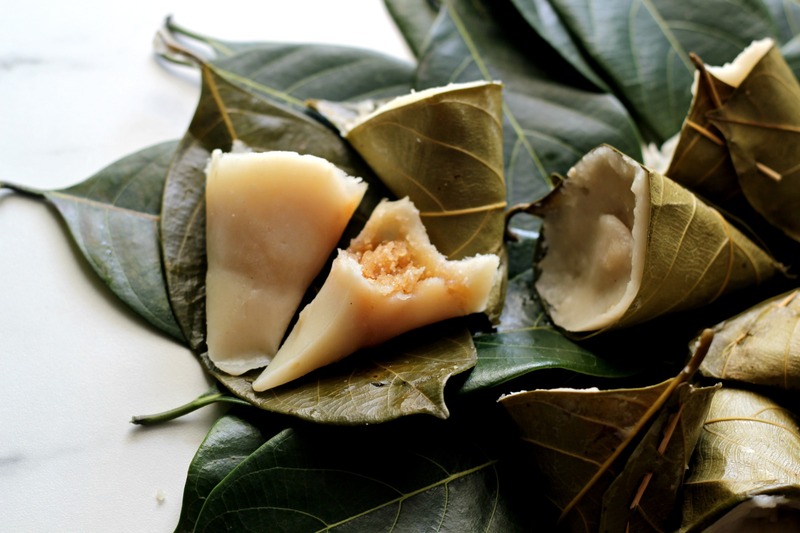 Idiyo – Sweet Rice Dumplings Steamed in Jackfruit Leaf Cones – GF + Vegan + Video! We are inching towards the fag end of August. The wrath of the scorching summers is upon us! A few days from now the new academic year begins and we are gearing up for that. Perhaps that’s one reason why you don’t see many posts from me. I am spending a lot of the kids whilst trying out a lot of recipes too. So once school starts and they are out of my hair, I will be able to post recipes more frequently. When someone in my family was travelling to Mangalore last month I requested them to bring some jackfruit leaves for me. I have been waiting to try out this recipe for really long. 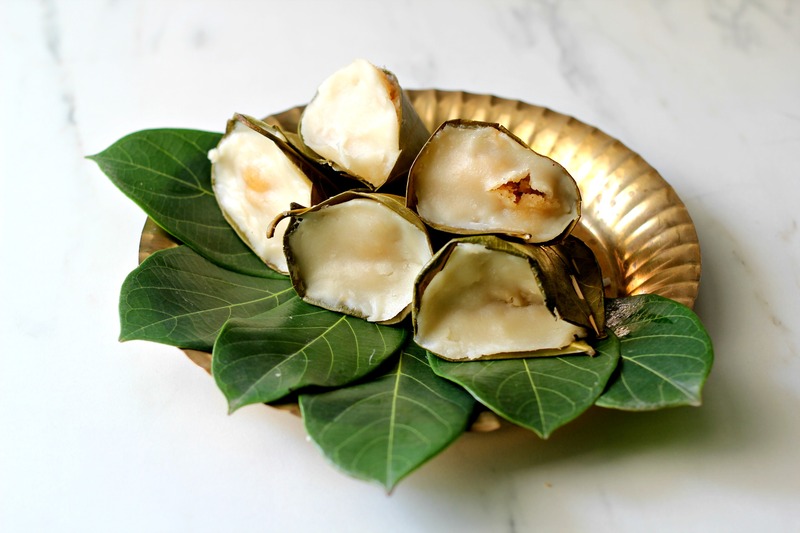 It is one of the traditional recipes of Mangalore and has its versions depending on which community is making them. We call it the ‘idiyo’ and is perhaps one of the many sweet & savoury rice breads made using jackfruit leaves as a casing. When I decided to make these I thought I should capture the whole process in a video. It was tiring yet fun and especially since the leaves were limited in number, I could make no mistakes when it came to shaping them into cones. The process is pretty easy and the result is worth it! 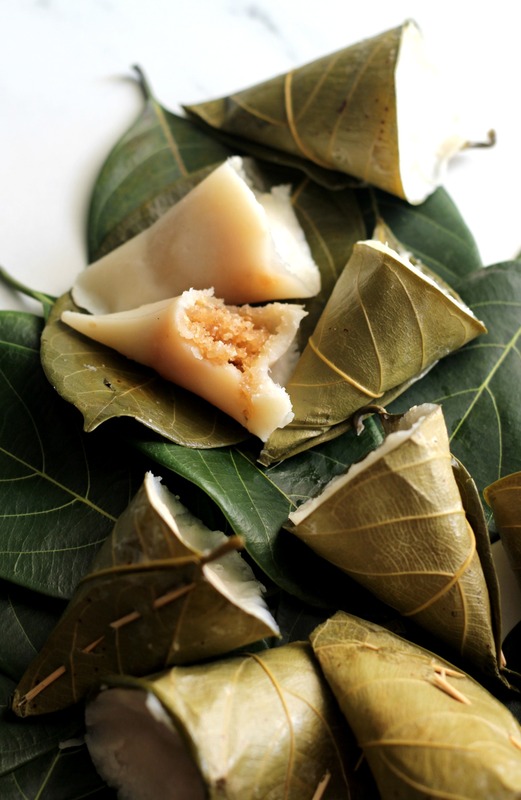 Especially if you associate the monsoons with eating rice dumplings stuffed with a jaggery & coconut filling! Can’t make it now? Save recipe for later on Pinterest! Do check out the video of how to make this dish! I hope you enjoy it! If you liked this video please do subscribe to my channel! Also, like, share & comment on it! It will really really motivate me to shoot more videos! 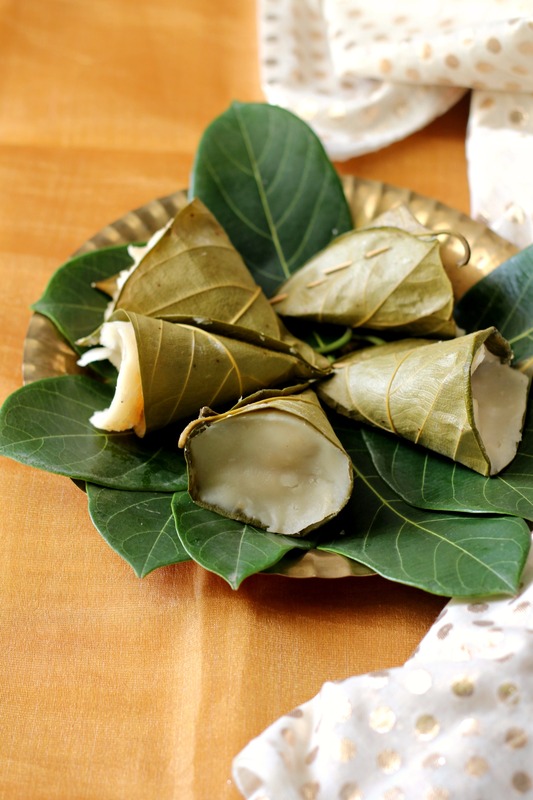 Rice dumplings stuffed with a delicious coconut & jaggery filling and steamed in little jackfruit leaf cones are a delight to make and eat! Wash the jackfruit leaves well, drain and pat dry with a clean kitchen towel. Hold a leaf horizontally in your palms with the smooth side facing upwards. Fold both ends towards the centre thereby forming a cone. Secure the edge using two pieces of broom stick or toothpick. Repeat till all leaves are shaped. 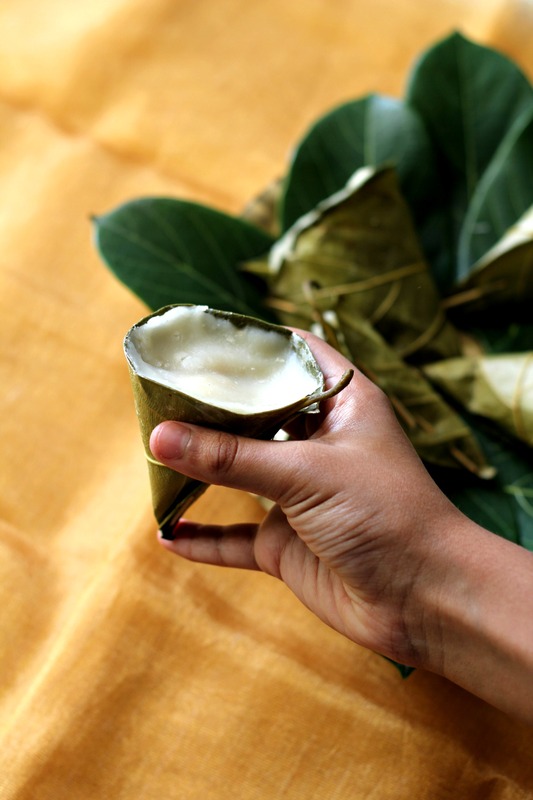 Take a small lime size ball of batter and line the insides of the leaf cone to form a thin layer. Dab your fingers in a little water if required to spread it evenly. Next, take a lime size ball of the filling and stuff it into the cone. Cover with a small portion of the batter to seal. Repeat till all the batter & filling have been used up. Bring some water to a rolling boil in a pot/idli steamer. Line the slotted plate/colander with a clean muslin cloth and place the prepared cones into the slotted plate/colander and cover. Steam for 20 minutes. Remove gently and let them cool for a bit before enjoying them! 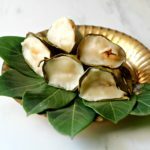 It is important to use freshly plucked leaves. Older leaves tend to dry up and turn crumbly and will break when you shape them into cones. If you plan to source them from somewhere and will make this dish after a gap of a few days ensure that you wrap them up very well. To do this, take a a clean kitchen towel and soak it completely in water. Then wring/squeeze it to remove all the water. It should be only damp and not dripping with water. Spread it out, place the leaves inside and wrap them well. Place this cloth packet inside a large ziplock/polythene bag in the crisper drawer (vegetable compartment) of your fridge. The leaves stay well for upto 7 days. This is my all time favourite.. loved the way you have described it. Thanks Shireen. Mmmm Yummy!!!! This is my favorite comfort food!!!! My aunt always cooks this for me when I visit Mangalore! Thanks for sharing the recipe Shireen! Thanks for the appreciation Sandy! Hi… I really liked the recipe & would be trying it soon. It looks quite easy. Just a small question can I use any other leave instead of Jack fruit?